This deer seems to be weaving in and out of some saplings! The wintry scene was so simple to make that I made another one! 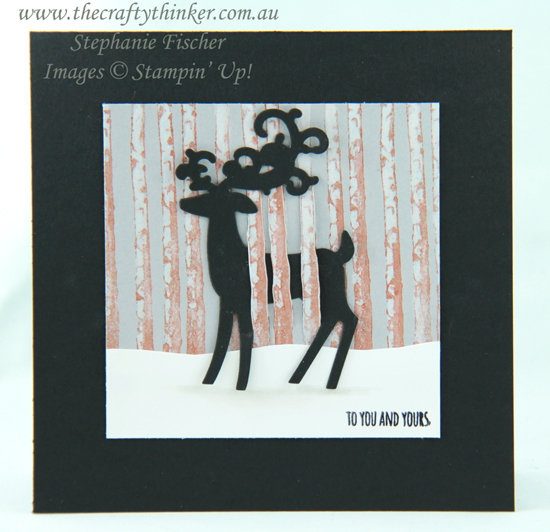 I stamped a row of trunks from the Winter Woods stamp set onto Smoky Slate cardstock with Bright Copper Shimmer Paint (I roll the Shimmer Paint onto the stamp with a sponge roller). I used my heat tool to set/dry the paint and then I used a paint brush and some Whisper White Craft ink to highlight the trees, smudging with my finger from time to time to blend a bit. I used a craft knife to cut down each side of some of the trees, just in the middle of the piece. I found the easiest way to weave the deer through the trees was bottom first! Once he was in position, I simply attached him with a couple of glue dots. With my snips, I cut a random curvy top a piece of spare white cardstock, put a line of glue on the back of the curvy top and slid it under the deer's feet before securing it into position. I added a subtle shadow under the deer's feet with a small brush and a little Smoky Slate ink. 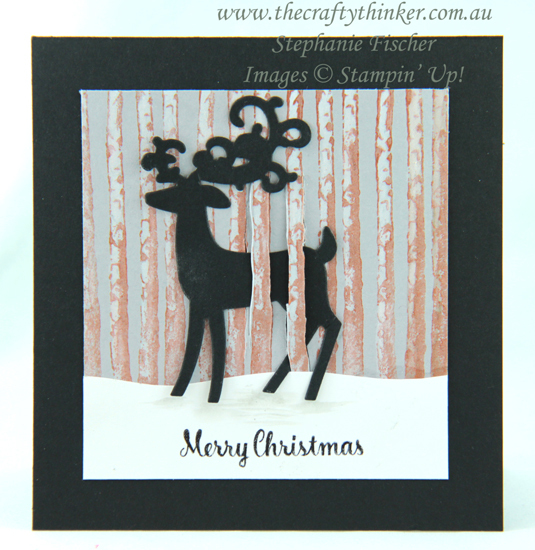 Having stamped the greeting, I trimmed the piece to size and attached it to the front of the Basic Black card.